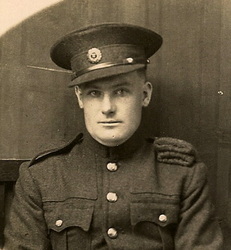 Gerald Joseph Byrne (1870-1948), was born 21st April 1870 in Clonmel. 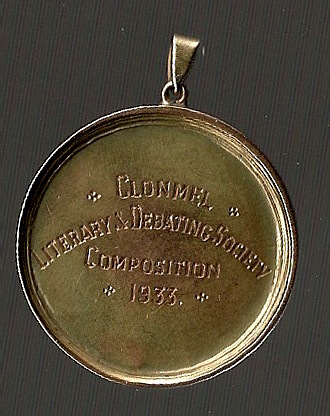 of St. Peter and Paul where he was regarded as a brilliant student, particularly in debating, see his gold Medal of 1933, and was an exhibition prizewinner. Because of the repercussions of the 1840s famine, and the subsequent sale of the Sleaty estate, Charles was apprenticed to a draper's shop in Tullow, Co. Carlow. the turn of the century, Gerald had to find his own way in life. 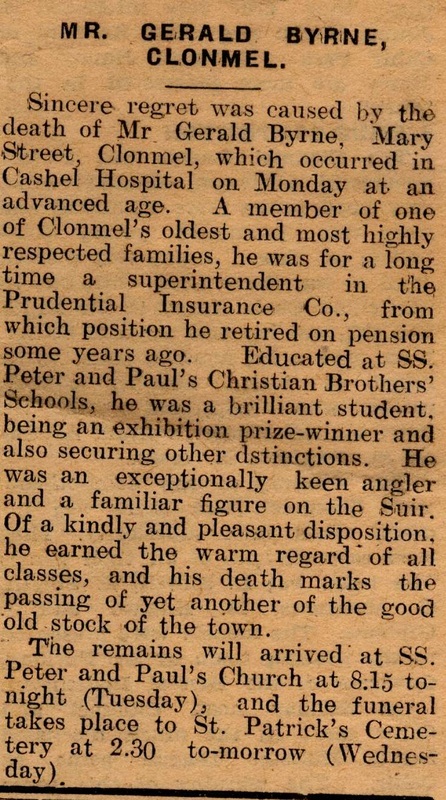 He started work as a clerk with the local branch of the Prudential Insurance Company. He would have had a difficult life collecting small premiums every week from people who could ill afford it. He became superintendent by the time of his retirement. Throughout his life he had very little income. Gerald visited Kingstown around 1888 where he met his spinster aunts, Emily and Clare, and his grand aunt .... Mary (1803- 1897), who he considered as "a woman of nearly 90 years old at that time". 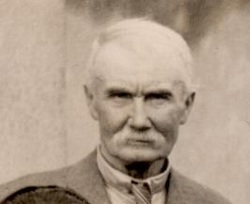 He married Bridget Mary (Delia) Considine in about 1900. She was from Clogheen, Co. Tipperary, but had been born 15th May 1869 at Feighquinn, Tulla, Co. Clare. The couple lived for a short time in Gladstone Street, Clonmel, but in October 1904 Gerald took a lease on 13 Mary Street. He recalled in a letter to his son James the visit of his uncle Alfred Byme to Clonmel around 1905. Gerald was an exceptionally keen angler and he fished the River Suir, where it ran through Clonmel, and the nearby mountain streams. A photograph of him fishing once appeared in the Nationalist newspaper.